Visitors to Greece, finding the ruins of so many ancient theaters and amphitheaters around the county, could be forgiven for imagining that the Greeks were addicted to entertainment and public spectacle in the same way that modern audiences watch their favorite video dramas or blockbuster movies. In ancient times, almost every city and most larger towns had at least one theater — some large enough to seat audiences of 15,000 and more. But the Greek theater that flourished from about 600 BC onward was about much more than entertainment. Starting out as pageants in honor of the Greek Gods, plays became acts of public responsibility and citizenship. Through the tragedies and comedies played out before them, Greek men were encouraged to consider their roles in society, to debate issues, to exchange political and religious ideas and views. Women rarely, if ever, took part and all roles were played by men and boys. Over time, the theaters, usually built into hillsides or natural hollows, disappeared. The marble and dressed stone they were built of finding its way into local buildings, much as stretches of Hadrian's Wall in Britain now lives on in farmhouses and stables along the route. The theaters slept buried in various landscapes until discovered In the late 18th and 19th centuries by the "new" breed of scientists, the archaeologists. Discoveries — and restorations — of these ancient theaters continues to this day. Several of the theaters in this list are UNESCO World Heritage sites. In 2018, 15 more Greek theaters were on the UNESCO "pending" list. Today, a handful of these ancient places have been returned to use — for performances of music and drama. Because they are fragile and open to the elements, they are usually only in use for a few weeks to a few months of the year, during special festivals. 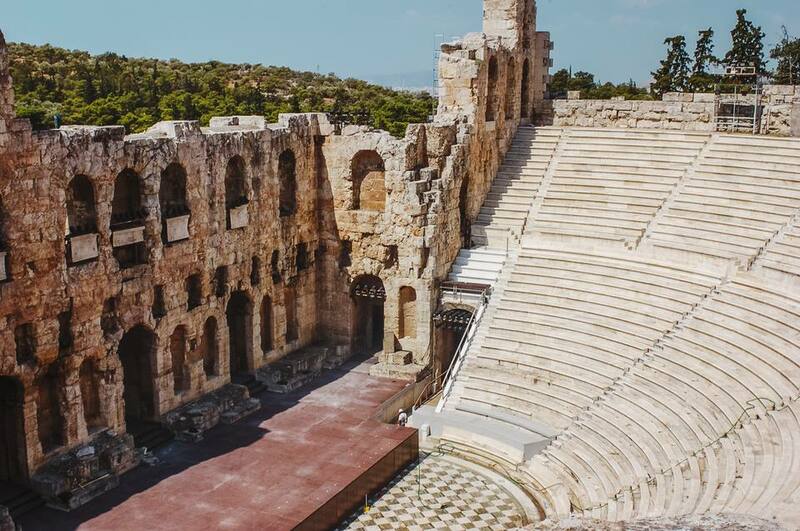 Plan your trip carefully and you might be able to watch a play by Euripides or Sophocles — or enjoy a concert or dance performance — just as the ancient Greeks did. As the most important sacred site in Athens, the Acropolis was a gathering place for all sorts of rituals during ancient times. The south slope has actually been occupied by three different theaters, only one of which is open for performances today. That is the Odeon of Herodes Atticus, known by locals as the Herodeon. It was built during the Roman era, between 160 and 174 AD and had completely disappeared under earth and rubble within a few hundred years. Rediscoverd in the mid 19th century, it was restored in several phases throughout the late 19th to the mid 20th century. Even before its most recent restoration, it was used for music and drama festivals through world wars and civil wars. It became the home of the newly formed Greek National Opera in the late 1940s and a young Maria Callas performed there. In 1950s it was totally restored and reconstructed. Two other theaters are nearby. the 2,500 year old Ancient Theatre of Dionysus is an archaeological site that you can visit as part of a visit to the Acropolis. It is considered to be the home of European theater and once hosted the premiers of works by Aeschylus, Sophocles, Euripides and Aristophanes. No performances are currently held there but restoration plans for the 15,000 seat theater have been underway for some time. Even older, The even older Odeon of Pericles, on a corner of the Theatre of Dionysys, is believed to have been the world's first roofed theater. It is an archaeological site and today only exists as a virtual reality model created by scientists at the Warwick University. What Can You See There: Since 1955, it has been the main theater for music performances of the annual Athens and Epidaurus Festival, held from June 1 to the end of July. The theater seats about 4,500. Tickets go on sale as performances are announced, from mid winter through the spring before the festival. Buy them through the website or in-person at the theater (Dionysiou Aeropagitou Street, Makriyianni, daily) or the festival box office (39 Panepistimiou Street, inside the Pesmazoglou Arcade, Monday to Saturday.) Sting was set to be one of the headline performers in 2018. Need to Know: The nearest Metro station is Acropolis, Line 2. Entrance to the theatre is on Dionyssiou Areopagitou Street, the pedestrian avenue that links all the sites on the Acropolis. The tiers of seats are steep so heels are not permitted. Some accessible seats are available on the lower tiers, with ramp access, and wheelchair users can be driven to the square in front of the theater. The Ancient Theatre of Epidaurus, is the second main venue of the annual Athens and Epidaurus Festival. It was built as part of a sanctuary to the god of medicine, Asclepius, Athletic, poetry and musical contests, as well as dramas were held there in the god's honor. Seating an audience of about 14,000, the theater was built into a natural hollow on the west side of a mountain near the modern town of Lygourio. It is considered to be the best preserved ancient Greek theater since it does not seem to have been changed or rebuilt by the Romans. It's also known for it's magnificent acoustics. Visit during the day when no performance is being held (it's open from 8:30 a.m. for an admission of €6) to check out the amazing acoustics for yourself. Stand in the perfectly circular, original orchestra pit and whisper to a friend sitting in an upper tier. Your whispered voice will carry clearly and perfectly. What Can You See There: Since the late 1930s, with time out for World War II, the theater has been used for performances of classical Greek drama — with Greek and foreign actors — and occasional major musical performances. Since 1954, organized drama festivals have been held each summer and the theater is now a main venue for the Athens and Epidaurus Festival with performance through July and August. Don't worry about not speaking Greek. Most performances are accompanied by surtitles, projected on screens on either side of the stage. Not all plays are Greek classics, modern European theater and even some Shakespeare is often included. Need to Know: The theater is in the Argolis prefecture of the Peloponnese, about a half-hour drive from Nafplio or two hours from Athens. Take the Athens-Corinth Motorway, exiting at Nafplio and following signs to Lygourio. There is ample parking and a cafe bar at the site. The site is inscribed in the UNESCO World Heritage List. The Little Theatre of Epidaurus, on the coast of the Saronic Gulf was built for the requirements of the people of the ancient city state of Epidaurus. The town controlled the major religious Sanctuary of Asclepius (site of the Great Ancient Theatre of Epidaurus, above), a four hour walk. While the theater at the sanctuary was big enough to seat pilgrims from all over Greece, the little theater never held more than 2,500 — enough for the local community. It has only 9 tiers, with 18 rows of benches. The theater was built at about the same time as the Great Theatre, in the mid 4th century BC. It was substantially adapted during the Roman era. The theater was in use for seven centuries. When it was rediscovered and excavated in the 1970s, it was buried under an olive grove. Some things haven't changed much since ancient times. It seems there have always been subsidized, non-commercial theaters needing sponsors. The names of sponsors and civic officials at this theater are carved into many of the stone seats. Today, performances are possible at this theater largely through the generosity of private sponsors. What Can You See There: Musical July was eight days of events that were part of the Hellenic Festival. In 2018, this theater is being programmed by the Athens and Epidaurus festival and it will host classical Greek drama for four days in July and two in August. Need to Know: This theater is best visited if you are staying in the Argolis area of the Peloponnese. While there are bus services from Athens (KTEL bus to Palea Epidavros at 16.00 and a ten minute walk from bus terminal to the theater), there is no return bus after the performances. There are several 3-star hotels in Palea Epidavros, also known and Archaiea Epidaurus. The Ancient Theatre of Philippi is in the extreme northeastern corner of Greece in the city founded by King Philip II of Macedon, the father of Alexander the Great. It was later an important Roman city and an early Christian settlement. St Paul preached to the Philippeans at this theater around 49 or 50 AD. The theater is part of a major UNESCO listed archaeological site about 16km from the city of Kavala. What Can You See There: The Philippi Festival is an annual festival of theater, music, dance, visual arts and poetry held annually, throughout July and August. The festival venues include the ancient theater as well as several locations around the city of Kavala. Some years it is known as the Philippi and Thassos Festival when an ancient theater on Thassos, an island 20km offshore of Ancient Philippi, also participates. A program is usually published online and is available in English translation in the spring. Like many Greek web resources, it can be buggy and difficult to find. This sample program from the 2016 Philippi Festival will give you an idea of what to expect. Need to Know: Try to organize a visit to this festival when touring Northeastern Greece. It combines will with visits to Thessaloniki and to Kavala, an ancient city that, since the nearby ancient site of Philippi was UNESCO listed, been improving its tourist resources. This theater, on the island of Thassos in the Northern Aegean Sea, may date from as early as the 5th century BC. Because it is still constantly under excavation and repair, it is not always open to visitors. But it is usually used for smaller events as part of the Philippi and Thassos Festival (see above). The theater is a steep climb above the island harbor, in the town of Limenaria next to the island's own acropolis. What You Can See There: The theatre hosts small events, poetry and music when it is included in the Philippi Festival, The island of Thassos also has an annual carnival with some events happening in the theater. Need to Know: At the moment, because of the state of the Greek economy and the lack of really effective central tourism resources, the best way to find out what is happening on Thassos is to contact the island directly, through the contact form on the Thassos website or by email. This theater is just outside the city limits of the town of Dion, about 55 miles southwest of Thessaloniki. Though discovered in the early 19th century, systematic excavations here did not start until the 1970s. It is part of the Dion Archaeological Park, a site covered with many centuries of ancient ruins. Since 1982, excavations have been conducted by the University of Thessaloniki. Beside the theater, there are shrines to Demeter, Isis, Zeus, Olympian Zeus, a Roman theater, a Greek Theater and Roman Baths. The slopes of Mount Olympus rise to the southwest. What You Can See There: For more than 40 years, The Olympus Festival has used the 4,000 seat Ancient Theatre of Dion as one of its venues. Performances of contemporary theater, music and dance are held throughout July and August. Need to Know: Because most of the information offered online is in Greek or Google translation, and often out of date, the best chance of seeing a performance is to join a cultural tour, or day trip from Thessaloniki scheduled to include a festival performance. In 2017, Tsakiris Travel organized an evening trip from Thessaloniki to see Seven Against Thebes. Check their blog to see what they may have coming up. To find out more about all of Greece's ancient theaters, their current state and future plans, visit Diazoma, a Greek citizens organization that conducts studies, raises funds and recruits sponsors for the ancient theaters' restorations and protection. Have You Met Dionysus, God of Wine?